The end of June, having been six months in Hanley, the General informed me that he wanted me for another sphere of labour. Mrs. Smith was in delicate health at the time, and the ladies of the town sent a petition to Mrs. Booth, appealing to her, as a wife and mother, that for the sake of my wife's health I should be allowed to stay in the town a little longer. The General readily gave his consent. When the leaders of the Free Churches knew that I was likely to be removed from their midst, a committee was formed, representing all the Churches in the town and neighbourhood save the Roman Catholics. This committee, a leading member of which was a churchwarden, impressed by the striking work of grace which had gone on under my poor feeble ministry, felt that I should not be allowed to leave the district without some expression of their love and appreciation, and presented me with a gold watch, bearing this inscription: - " Presented to Gipsy Rodney Smith, as a memento of high esteem and in recognition of his valuable services in Hanley and district, July, 1882." My wife and my sister, Mrs. Evens, each received a gift of five pounds. These presentations were made at a public meeting, presided over by Alderman Boulton, who was supported by many of the leading persons in the town. The gifts came from people who were outside the Salvation Army. The soldiers of the Army had some intention of making us a gift, but we stopped that movement, as we knew that the General did not approve of such presentations. To my surprise, about two weeks after, Major Fawcett, my superior officer, called on me about these presents. He said that he was sent to ask me what I had to say about those testimonials. I said that the gifts had not come from soldiers of the Army, that they came entirely from outsiders, that I had done no more than many other officers, and that a little while ago an officer in Birmingham had received a silver watch. I added that when I received the gifts I rather felt that headquarters would be delighted that we had made such an impression on the town, and that outsiders were showing appreciation of our work. The Major told me that I should hear from London shortly. On August 4th a telegram arrived for the two lieutenants, who had received silver watches from the same committee, summoning them to London. There was no communication for me that day. These young men had been with the Salvation Army for six months, and I had been for five years. The young men came to seek my advice. I urged them to obey the summons at once. They reached London early next Morning, and on their arrival at the Training Home in Clapton, they were told that if they did not give up their watches they must leave the Army. "We understand on Monday, July 31st, a presentation of a gold watch was made to you at Hanley, accompanied by a purse containing £5 to your wife, and the same to your sister. We can only conclude that this has been done in premeditated defiance of the rules and regulations of the Army to which you have repeatedly given your adherence, and that you have fully resolved no longer to continue with us. The effect of your conduct is already seen to have led younger officers under your influence also astray. Having chosen to set the General's wishes at defiance, and also to do so in the most public manner possible, we can only conclude that you have resolved to leave the Army. Anyhow, it is clear that neither you nor your sister can work in it any longer as officers, and the General directs me to say that we have arranged for the appointment of officers to succeed you at Hanley at once." I was greatly upset by this letter. Some of the statements in it were wholly inaccurate. In the first place, I had never given my adherence to any rule forbidding the officers of the Army to receive presents. I knew that at a conference of officers the General had made a statement in regard to this matter. He strongly disapproved of the practice, for the reason that some officers, leaving their stations in debt, went off with costly gifts. Moreover, the tendency was that while successful officers received presents, those who had not been successful got none. This of course, was not conducive to good feeling and discipline. I ought to say that throughout his speech the General was referring to gifts from soldiers of the Army - at least this was my impression. It did not apply to presents, such as mine had been, from outsiders. Another grossly inaccurate statement in the letter was that I had led astray two younger officers. The two young lieutenants accepted their watches without consulting me and without receiving any advice from me. None of us had ever dreamt that trouble would come from these presentations. The letter was totally unexpected, and gave me a painful shock. I was utterly overwhelmed, and such a communication reaching me a few hours after the birth of my second son, was in the greatest degree depressing. The letter was not only inaccurate, it was ungracious. There was no word of appreciation for my five years' hard work, for I had held some of their most important commands, and had succeeded as few others of their officers had done. During that summer I had often secretly thought that some day I might leave the Army, but I never gave expression to these sentiments except to my wife. I had written out my resignation twice, but my wife had prevailed upon me not to send it, and so the letters were put in the fire. I knew in my own heart that I was not a Salvationist after their sort. I felt thoroughly at home in the Christian Mission, but rather uncomfortable and out of place in the Salvation Army. I did not like the uniform, I did not care for the titles nor for the military discipline. My style was not quite Salvationist enough. Still I succeeded, and the Army gave me a splendid sphere for work and an experience which no college or university could have supplied me with. But I had never had any desire to leave in this abrupt fashion. I had hoped to withdraw in the most friendly manner and to remain on good terms with the movement and its leaders. But this was not to be. My heart was heavy as the prospect of parting from beloved friends and comrades opened, blank and bare, before my soul. I took the letter to my wife and read it to her. She felt greatly hurt, because she had been very loyal to the Army and its leaders, but she bore it bravely and was very ready to stand by me. My first impulse was to take the letter to the editor of the local paper, and then I thought, "No, Sunday is before me, I will keep the matter to myself till the end of the Sunday services." I determined in this way to communicate the news to all those who sympathised with me and my work. There were great congregations all day. I required no small amount of strength to go through my work, but I was wonderfully sustained. I preached the Gospel as faithfully as I could, despite the burden on my heart. At the evening service the building was crowded to suffocation. I had stated at the morning and afternoon services that I had a very important intimation to make at the close of the evening service. I arose in a stillness that could be felt to read the letter from Mr. Bramwell Booth. When I had finished, there was an extraordinary scene. I needed all the self-possession and tact that I could summon to my aid to quell the anger of the people. They began to hiss. But I said, "That is not religion. We have preached charity, and now is the time to practice what we have preached." And they dispersed quietly, but in a state of great excitement. In the meantime I had replied to the letter from Mr. Bramwell Booth. I concluded my answer thus: "I need not say how sorry we all are in reference to the steps taken in the matter. You know I love the 'Army' and its teachings, but, as you wish, I shall say 'farewell' on Sunday. But I shall reserve the right to say that you have turned us out of the 'Army' because we have received the presentations. I can hold the world at defiance as regards my moral and religious life. If I leave you, I do so with a clear conscience and a clean heart. Of course, my sister and myself hold ourselves open to work for God wherever there is an opening." Early the next morning the Testimonial Committee was called, and meetings were held every day of that week up to and including Thursday. 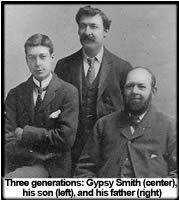 They sent communications to the General, stating how sorry they were that my dismissal had arisen out of their act, an act which was one of good-will and in loving appreciation of Gipsy Smith's services. They said that if they had known what the result would be, they would rather have lost their arms. No good was accomplished by the letters, and so a deputation was sent to London to see the General. It was arranged that they should send a telegram to the meeting at Hanley on Thursday night announcing the final decision. The place was crowded to receive it. The telegram said: "Dismissal must take its course." Immediately there was a scene of the wildest confusion. At the close of my last Sunday's services as an officer of the Salvation Army we found two brass bands outside waiting for us. I had no desire for demonstrations of this sort, and had no knowledge of these elaborate preparations. Two big Irishmen seized me and lifted me on to their shoulders, my sister was politely placed in an arm-chair, and the bands, accompanied by great crowds, carried us all round the town, and finally took us home. From five thousand to ten thousand people gathered outside the house on a piece of vacant land. They shouted for me again and again, and I had to address them from the bedroom window before they would move away. And so ended my connection with the Salvation Army. It has given me anything but pleasure to set forth the story of my dismissal, but I have felt - so important and cardinal an event it was in my life - that it must be told in full. I have not the least desire, and I am sure that my readers will believe this, to damage in the slightest degree the leaders and workers of the Salvation Army. I consider it one of the greatest and most useful religious movements of the last century. Its great service to the Christianity of our country was that it roused the Churches from their apathy and lethargy, and awoke them to a sense of their duty towards the great masses who were without God and without hope in the world. I shall always be grateful for my experiences in the Salvation Army, and I look upon the dismissal as providential. God overruled it. If I had carried out the intention that I had formed some time previously and had resigned quietly, nothing would have been said or heard about me in that connection at any rate; but the dismissal gave me an advertisement in all the papers of the land which cost me nothing and procured for me hundreds and thousands of sympathisers. I have the warmest feelings of love and admiration for General Booth. He gave me my first opportunity as an evangelist, and he put me in the way of an experience which has been invaluable to me. I think that William Booth is one of the grandest men that God ever gave to the world. His treatment of me was always kind and fatherly. I do not myself share the frequently expressed view that Mrs. Booth was the real founder and leader of the Army, General Booth is too gracious and chivalrous, and besides, he has too profound a sense of what he owes to his beloved and lamented wife, to contradict this view. But, for my part, I believe that William Booth was both the founder and the leader of the Salvation Army. Catherine Booth was undoubtedly a great woman, a great saint and an able preacher, but even as a preacher she was in my opinion greatly inferior to the General. I always feel when I read her printed sermons that I know very much what is coming, for there is a sameness about her addresses and sermons. But the General, on the other hand, never gave an address or preached a sermon without introducing something quite fresh. He is more original and more ready than his wife was, and had he given his time solely to the pulpit he would have been one of our greatest preachers. But for many years he was fully occupied in the defence and explanation of the methods and aims of the Salvation Army. I have heard him talk for nearly a whole day at officers' conferences in a simply marvellous fashion - without intermission, full of ideas, practical and possible, and full of common sense. He was splendidly seconded in his work by Mrs. Booth, and has at the present time able coadjutors in his children. The officers of the Salvation Army are men of intelligence and zeal. I have the happiness to number a good many of them among my friends today. Some of them indeed, were brought to God under my ministry.